This issue and next, I want to take a good look at the Macintosh emulators available for the ST. There are now two on the market: The Magic Sac from Data Pacific and Spectre 128 from Gadgets by Small. Although very different in application, both emulators have seen quite a few changes since their respective beginnings. Created by David Small, the Magic Sac is the better-known of the Macintosh emulators. It's a cartridge into which you insert a set of 64K Mac ROMs. Since its inception over two years ago, the Magic Sac has undergone several software revisions. Early versions couldn't run much Macintosh software without crashing-which wasn't necessarily the fault of Magic Sac. In fact, the emulator was written on the assumption that Apple's rules for Mac programming applied. Unfortunately, many developers- often including Apple itself-had violated the rules, so the Magic Sac had to be revised to run as much of this non-conforming software as possible. 64K ROMs and therefore can't run programs requiring 128K ROMs. Another development that forced changes in the Magic Sac's software was Apple's release of the Macintosh II. The Mac II was a considerably enhanced version of the Mac, boasting a color monitor, slots for add-in cards and a host of other features. Unfortunately for software vendors (and fortunately for Magic Sac users), the Mac II also would not run software which didn't follow the rules. Thus, software vendors scrambled to revise their software to run on the Mac II, and in the process much of the revised software could run on Magic Sac as well. A further kink in the Magic Sac's history has been its lack of compatible Mac software. Although the ST and the Mac use the same size diskettes, they can't read each other's disks. 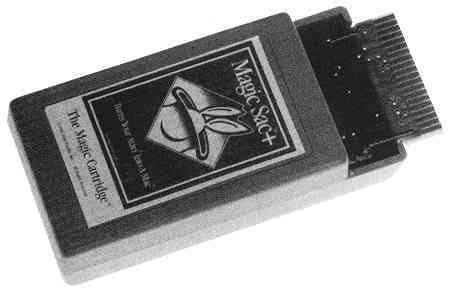 The original solution was the development of Magic-format disks, which the Magic Sac can read. Data Pacific sells a cable that lets you connect a Mac to an ST, along with software for transferring programs from the Mac to the ST. Of course, this requires having access to a Mac, which many people don't. Some software stores started selling Mac software in Magic format, but these were few and far between. So David Small and Data Pacific developed the Translator, a computer that plugs into the ST's MIDI ports and lets ST disk drives read and write Macintosh-format disks. The Translator also allows the Magic Sac to run some protected software that couldn't be ported to Magic format. Spectre 128 is the new Mac emulator from Gadgets By Small. Translator, so it can read disks in Magic, HFS and MFS formats. There are, however, limits to what the Magic Sac can do because it's based on the 64K ROMs. About three years ago, Apple introduced the first Macintosh based on 128K ROMs. the Mac Plus. Not only did the new ROMs fix many of the problems and limits associated with the 64K ROMs but Apple provided an easy upgrade path for all owners of earlier Macs. As a result, Apple no longer supports the 64K ROM-equipped Macs. Thus, quite a bit of software can't run on the older machines (and thus will not run on the Magic Sac), including MacWrite 5.0, MacPaint 2.0, Suitcase, Ready-Set-Go and Pagemaker (desktop publishing packages). Adobe Illustrator, Freehand and MicroSoft Powerpoint (presentation graphics). Apple's Hypercard, packaged with all new Macs. also requires the new 128K ROMs. Hypercard is a pictorial programming language as well as an extraordinarily useful utility. You can build your own applications using all the basics that make the Mac famous for its ease of use. Hypercard has taken the Mac world by storm, but you can't use it with Magic Sac. Another limitation addressed by the new ROMs is the disk filing system. The original system, MFS (MultiFinder System), was fine for single-sided disks with few files, but it couldn't handle disks with several files. The old Macs could use the more powerful HFS (Hierarchical Filing System) format, but only after loading a special (and reportedly buggy) file called Hard Disk 20, which worked with double-sided floppies and hard drives in HFS format. Unfortunately, Hard Disk 20 had to be loaded in order to enable the old Macs to recognize HFS, which meant the boot disk had to be MFS. Complicated instructions had to be followed to enable Magic Sac to boot up from the hard drive and use an HFS-formatted drive. Not only that, the instructions in the Magic Sac documentation differ from those in the Translator docs. But just remember, owners of the original Mac had to deal with the same problems. The 128K ROM Macs run more software, read HFS- and MFS-formatted disks and have full hard-drive support. Data Pacific had planned a 128K ROM Mac emulator but never got around to developing it. Instead, the 128K ROM Mac emulator, Spectre 128, was produced by David Small's new company, Gadgets by Small. 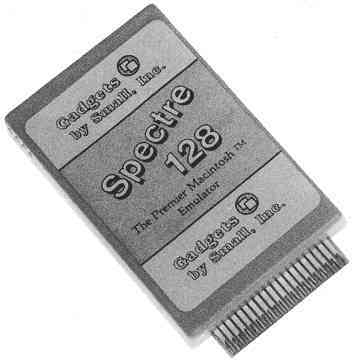 Spectre 128 is a cartridge that requires a set of 128K ROMs, and can read Magic-format disks. It is also compatible with the Translator so that it can read and write both MFS- and HFS-formatted Mac disks. It requires at least one megabyte of memory There's no provision for porting Mac software, however, so you're on your own to get your Mac software into a usable format. Next month, we'll take a long, hard look at Spectre 128, as well as some of the dynamite programs you can use with it. Magic Sac, $149.95. Data Pacific, Inc., 609 West Speer Boulevard, Denver, CO 80203. (303) 733-8158. Spectre 128, $179.95. Gadgets by Small, Inc., 40 West Littleton Boulevard, #210-211, Littleton, CO 80120. (303) 791-6098. 128K Mac ROM, $175. Shreve Systems, 2421 Malcolm St., Shreveport, LA 71108, (318) 865-6743; $125. Preowned Electronics, 30 Clematic Avenue, Waltham MA 02154, (617) 891-6851.